The Red Wings released their schedule for the 2017-18 season – their first at Little Caesars Arena – on Wednesday afternoon. It was already known that the Wings would open their new home on October 5, hosting the Minnesota Wild. They’ll close out the inaugural season on April 7, 2018, hosting the New York Islanders. Detroit’s first visit to the Vegas Golden Knights at T-Mobile Arena will be early in the season on October 13, part of their first road trip. Vegas will visit Detroit on March 8. With no outdoor game this season, the annual New Years Eve game returns. The Pittsburgh Penguins will be the visitors in the 2017 edition. The schedule features 11 sets of games on back-to-back nights, down from sixteen last year. The Red Wings will travel on two five-game road trips and three four-game trips. The Detroit Red Wings announced their home opener for the 2017-18 season on Wednesday, and it will be October 5 against the Minnesota Wild. The Red Wings will not be participating in another team’s home opener this season so we’ll have to wait until the full schedule is released on Thursday to find any more game dates. Detroit is winless all-time when opening up a new arena. On December 27, 1979, they dropped a 3-1 decision to the St. Louis Blues in their first game at Joe Louis Arena. They opened Olympia Stadium with a 2-1 loss to the Ottawa Senators on November 22, 1927. Their first game in Windsor’s Border Cities Arena – the team’s home for their first season – was a 2-0 loss to the Boston Bruins on November 18, 1926. With the announcement comes our first look at the Inaugural Season logo for Little Caesars Arena. I’d like it a lot more with the Winged Wheel left out. As it is, the LCA logo kind if looks like a toilet, and putting the Wings’ logo over top of it implies the Wings are in the toilet. Of course, given the season they just had, that might be accurate. The National Hockey League unveiled its new adidas-made jerseys in Las Vegas on Tuesday night. As expected, there weren’t significant changes for the Red Wings. Only home jerseys were unveiled but given the lack of change for Detroit’s red jersey, it’s safe to assume that the white jersey will remain similarly untouched. With the shift to the adidas “AdiZero” template, materials of the jersey will change, as will the position of some seams. This is most noticeable in the shoulders and collar area. I speculated when a jersey preview was released last week that the Red Wings would be changing to a a sewn-on nameplate instead of individually-sewn letters. It turns out that this nameplate was just for demonstration and the game jerseys will not include it. Either way, the Wings will be keeping their vertically-arched names. It appears as though the bottom stripe has changed a little. It now follows the curved hem of the jersey at a constant width. In the now-defunct Reebok Edge jersey template, the stripe was straight across the top, effectively changing width with the curve of the hem. Prior to the Edge design, NHL jerseys had a straight hem so both the top and bottom of the stripe were straight. One remaining question was the placement of the captains’ letters. 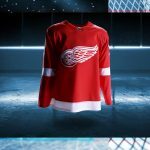 Per SportsLogos.Net founder Chris Creamer, who was on hand at the unveiling, the Red Wings will keep their letters on the right-hand side of the chest, opposite most of the league. As the AdiZero template features a more squared shoulder than the Edge template, the contrasting-color shoulders of the Red Wings’ road jerseys could be in for a slight change. That said, the Pittsburgh Penguins’ jerseys have translated the same effect to the new template. 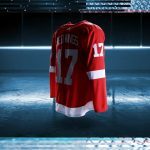 Update, 10:45 PM: The Red Wings were quick to tweet out photos of their road white jersey. This seems to confirm that the distinctive shoulders will remain. Additionally, the red waist stripe, like the white stripe on the home jersey, follows the curve of the hem rather than appearing straight. Finally, the team is utilizing a thick, red collar rather than the thinner collar some teams opted for. Update, 6/21 12:30 AM: Creamer confirms that the Red Wings’ game jerseys will not feature the nameplate shown during the jersey unveiling. The nameplate was just there for demonstration. 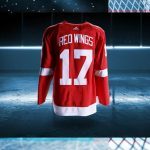 Red Wings to Add Nameplate to Adidas Jerseys? The National Hockey League’s jersey manufacturer will switch from Reebok to adidas next season and with it comes new standards in jersey design. Much like the league’s hyped move to the Reebok Edge system in 2007, many teams are taking the opportunity to change up their looks in some way or form. Fortunately – as was the case then – the Red Wings are not expected to make much of a change. A teaser image Tweeted out today does seem to show a difference, however. That appears to be a sewn-on nameplate, which the Red Wings haven’t used with their vertically-arced lettering. Up until now, Detroit player names have been sewn directly onto the jerseys. Personally, I think arched nameplates look awful, but the replica jerseys have been sold this way for several years now and I’m sure they’re easier to manufacture. Across the NHL, the Colorado Avalanche and New York Rangers are the only other teams to used arched player names. Both of those teams use nameplates sewn onto the jerseys. We’ll have to wait until the new jerseys are unveiled in five days to see if the arched nameplate makes an appearance. Author Clark RasmussenPosted on June 15, 2017 Categories Blog Post, Misconduct1 Comment on Red Wings to Add Nameplate to Adidas Jerseys? The Detroit Red Wings announced their 2017 exhibition schedule via Tweet on Thursday. It will be their first preseason at Little Caesars Arena. As per usual, the schedule consists of home and road games against the Boston Bruins, Chicago Blackhawks, Pittsburgh Penguins, and Toronto Maple Leafs. The Red Wings will start with three games on the road, then come to their new home for four games, then close things out in Toronto.